Sale: Price changed from $80 to $55!! 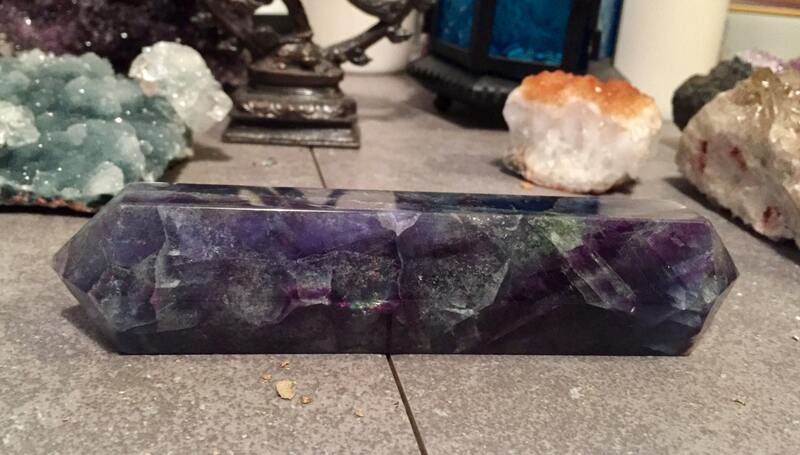 This beautiful Flourite wand has gorgeous banding of deep purple and blue that just radiate energy. There are some really cool rainbows in this piece. This double terminated wand is approximately 6 inches long and is about 1 inches around. It has 6 sides on each termination. This guy would be great for grid work or on an altar. According to lore Fluorite can increase intuitive abilities and helps to link the mind to universal consciousness. It is said that Fluorite can help one develop a connection to Spirit. Itis believed that it anchors intuitive insights into the physical plane, helping mental and physical coordination. It is a very popular stone among energy healers as it can clear the aura of mucky energies. Fluorite is said to assist in rapid organization and processing of information and can bring mental clarity and stability to an otherwise chaotic situation. It is said to be helpful in making sure the plans of the mind sit true in the heart. The ancients believed that It coils absorb negative energies from the space it inhabitwe and was especially effective with Auric and Chakra cleansing. Due to its powerful ability to absorb negative energies, Fluorite should be cleansed often.